Before starting, make sure you have a Google account (gmail account). This will be needed for verification. You can view AutoTutor Lite SKOs without a google account, but you will not be able to create or share a SKO without one. Clicking "OK" will open a new tab. If you have already created SKOs this is where you can see your SKO list. This page (http://sko.skoonline.org/myScripts.jsp) is also accessible inside the authoring tab by clicking on "Open". Currently, our matching, multiple choice, and fill-in-the-blank assessment types are being worked on, so they are grayed out. If you would like to create a SKO with one of the grayed out assessment types please contact keithshubeck@gmail.com. For this example, let's select a "Self Reflection" assessment type. 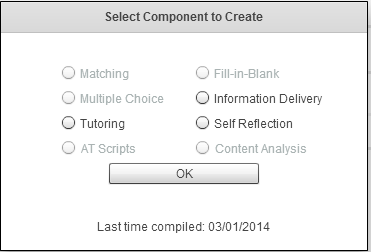 Assessment Selection: Selecting the "Self Reflection" option and clicking "OK" will bring up a self-reflection template titled "Self-Reflection Example". Naming your SKO: First, let's rename our SKO and save it. The title of the SKO will only be viewable to authors who have access to the SKO. The title of the SKO will not be viewable to the learner. I think it is very important for people to know about the constitution of the United States, so I'm going to create a brief SKO that covers the first and fourth amendments. Saving your SKO: Notice the red text that reads "Not saved yet". This is your friendly reminder to save your SKO. It is recommended for you to save frequently. So let's save our SKO after giving it a title, by clicking on the "Save" button. This will update the "Last Save" text, letting you know that the SKO saved successfully. Author Notes: Before moving on, it may be useful to leave yourself or other authors some notes about the SKO. Let's leave some notes in the text box located under the "Open" and "Share" buttons. Configure Components: Scene Defaults: Now let's configure the default information for the new scenes we will be creating. You can do this under the "Configure Component" tab in the Script Information screen. For more information about Scene Defaults, click here. Let's select a default background image. To do this, simply upload an image to a public image hosting website and then copy the image's url. Paste this image URL into the background image text box. I selected an image of the constitution I found from Google Images. For copyright purposes, I searched for images marked as "labeled for noncommercial reuse". Please Note: The ideal image ratio for background images is 660 x 500. Using an image with a considerably different pixel ratio and/or significantly smaller will result in image distortion. Authoring your Information Delivery: Now we're ready to start authoring our information delivery content. Do this by clicking on the Information Delivery tab. Because we loaded in a sample SKO, there will already be several slides created and populated. Let's go ahead and delete all of these and start from scratch. To delete a scene, click on the title of the scene and then click on the "X" button. Then select "Yes". Let's do this for all of the scenes. Adding New Scenes: Now that we've deleted all of the old scenes, let's add one of our own. Click on the "S" or "Add Scene" button to add a new scene. Editing Scene Spoken Text: For this scene I would like our teacher avatar to give a brief introduction to himself and to explain what this SKO will be covering. To do this, I'll insert the text I would like the teacher avatar to say in the "Spoken" box in the content tab. To make my Avatar seem a little more personable, I'm going to add in a few gestures and smiles. To do this, click on the menu button located to the right of "Test". For more information on inserting avatar actions and testing your avatar's speech click here. Configuring Individual Scene: Now that we know what we want our Avatar to say for this scene, let's make sure the right Avatar (teacher) will be talking. To do this, click on the scene configuration tab. Then click on the "use" button next to the teacher avatar. For this scene, I want both of my student avatars to be shown, but I only want my Teacher avatar to speak. If you feel like some media would be useful to add to the scene, be sure to add the media's url into the media URL box, and then selecting the appropriate media type from the Media Type menu. For more information about adding media to your scene click here. Inserting Self-Reflection Assessments: After a few information delivery scenes, I decided that I would like to assess my user's knowledge. To do this, I'll add a self-reflection scene by clicking on the "L" or "Add Self Reflection" button located under the "Add Scene" button. I want this self-reflection to begin after my 5th slide, so I'll click on the Self-Reflection scene and then click on the "A" button to move it up. Authoring your Self-Reflection Assessment: Now let's begin populating the self-reflection assessment. First we need to come up with the question for this assessment. Since this assessment type is best used for shorter answers (2 - 3 sentences), let's start with a fairly specific question. "Generally speaking, what does the first amendment protect?" I'll put this question in the Reflection Question Title box and the Spoken text box, because I want the question to be displayed to the user and I want the Avatar to ask the question. For more information about authoring a self-reflection assessment click here. Semantic Answer: Now let's determine what the target answer is going to be. Your target answer should be inserted into the "Semantic Answer" box located under the "Semantic Answer" tab. Ideally, your semantic answer will only include the most important words needed to fully answer the question. Try not to repeat a word more than once. Configure Feedback: Now that we have our question and semantic answer, let's set up our feedback. For detailed information and feedback strategies, click here. Ideally, your teacher avatar will provide feedback for each student input. One student input turn is demarcated with a "." at the end of the text. There are 6 different types of feedback rules explained here. For starters, it might be best to only use "CO" or total coverage for each turn. It is important to consider all types of student input for each turn. For example, some students might type "I don't know." as their first input. Given our semantic answer, this would likely result in a CO score of .0 -- So we should have a feedback trigger for either CO = .0 or CO < .1. To do this, click on the "CO" button at the bottom of the page. Then select "1" for the turn, and "less than" for the relation. Select ".1" for the value, and "teacher" for the avatar. The "Feedback from avatar" is what your teacher avatar will speak whenever a student provides input that has less than a ".1" score for total coverage on turn 1. It is good to have your feedback indicate whether or not the student's input is correct, near correct, or incorrect. For coverage scores less than .1, it might be safe to assume that the student input is incorrect, or at least marginally correct. So let's provide some encouragement to the student as well as a hint by typing: I know you can do this. What does the first amendment have to do with self expression? into the "feedback" column.